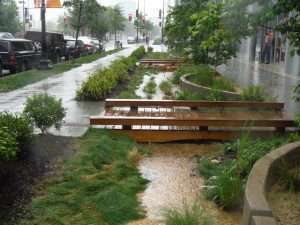 This category is for stormwater practices built in infill or redevelopment projects in urban areas with more than 75% site impervious cover. Below you will find information about the winners of the Best Ultra-Urban BMP category of the 2017 BUBBAs. To learn more about this year’s winners, check out the project files on our Google Drive here. 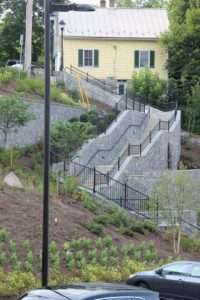 This project provided a unique solution to the urban infrastructure challenge of treating stormwater on a steep slope, while also increasing pedestrian safety in Historic Ellicott City. The project involved a two-tiered bioretention treatment train where water enters into a flume and is carried beneath the stairway into the first bioretention cell which, when full, flows over into a rock channel via a weir waterfall and into the second bioretention cell. A tree box filter next to the second bioretention cell catches water off of Lot E and an additional bioretention downhill from the flume entrance catches water not captured by the flume’s inlet. Densely planted native species uptake nutrients in the runoff while providing year round aesthetic value and habitat improvement. To read a complete project narrative and view more photos, please visit the project folder in our Google Drive. The new design for the DOEE headquarters building incorporates an 11,000 square foot green roof, and innovative curbside bioretention in the street right of way, along with numerous other environmentally friendly practices to earn a LEED Platinum certification and serve as an example for future green infrastructure designs. The new hospital green roof was designed not only for stormwater treatment, but to create a calming visual landscape for patients by replicating the local geography. The green roof visually mimics the area’s mountains, agricultural fields and Rivanna River, while increasing habitat function, treating stormwater and improving energy efficiency. 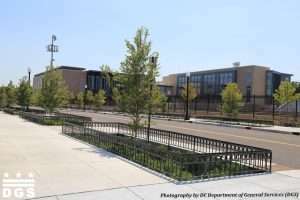 The O Street project was completed as a redevelopment project with the reconstruction of Dunbar High School, America’s first public high school for black students. The roadway contains a series of 33 bioretention cells lining both sides of the street that treat stormwater flowing towards two catch basins at the end of the block. The bioretention tree boxes each include at least one river birch which when mature will create an arching canopy over the sidewalk and street helping cool a highly urbanized neighborhood.